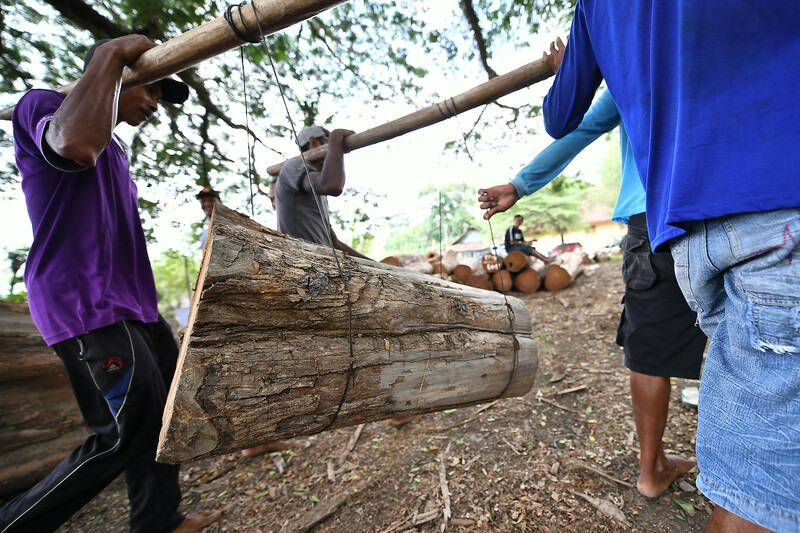 Her efforts are helping to build Jepara’s reputation as a home to legally-registered companies making quality products from legally-harvested timber. They are also linking consumers in Europe with Indonesian villagers who take care of their local forests. Business is booming. And having seen the benefits of ensuring her supplies are legal, Murliantini is encouraging other companies to follow suit. Maria Murliantini, Owner of Sunteak Alliance, a furniture factory in Jepara, Indonesia. Murliantini’s company — Sunteak Alliance — is classed as medium-sized. It employs 100-150 workers on the factory floor, with more in busy periods. In 2011, it became one of the first Indonesian companies of its size to gain Forest Stewardship Council (FSC) certification, showing it could trace its teak back to responsibly managed forests. This was a requirement for many European buyers. But because FSC-certified teak was in short supply and expensive, Murliantini struggled to meet customer demand and her exports declined significantly. This would have been fatal for her business. But around the same time, her buyers began asking for a new kind of certificate called SVLK that guarantees that products have been legally harvested and produced. SVLK stands for System Verifikasi Legalitas Kayu (Timber Legality Verification System in English). It was developed by Indonesia to addressed illegality by verifying legal compliance throughout the supply chain. It has since been backed by the EU through a trade deal agreed under the EU Forest Law Enforcement, Governance and Trade (FLEGT) Action Plan on illegal logging. As a result, Indonesian companies can now only export timber products to the EU if have been verified legal by the SVLK and issued with FLEGT licences that attest to their legality. The EU will not allow Indonesian products without FLEGT-licences to enter. For a furniture company to become SVLK certified and export FLEGT-licensed products, it must first be a legal entity, with a tax number, letter of incorporation, permits and other documents. It must then ensure its supply of wood is legal. Auditors check that all of the paperwork is in order before granting the SVLK certificate. Murliantini says that achieving SVLK certification is not difficult, but that the approach is very different to what the furniture sector in Indonesia has been used to. She likens adoption of SVLK to what children experience when they move from kindergarten to elementary school. “They are shocked, but there are teachers who get them up to that grade”. She praises the efforts by the government and international partners to raise awareness of SVLK and make it easier for small and medium companies to participate. The government reduced from one year to three months the period for which companies need to have documented their wood supply. The government also introduced group SVLK certification, reducing the economic burden on smaller companies that band together. In 2018, the government allocated 4 billion rupiah (240,000 euros) to subsidise the costs of SVLK for small and medium companies. In 2019, this will increase to 20 billion rupiah. Previously, the costs of certification had deterred people from pursuing legality. “Now everybody is doing it,” says Murliantini. She is very happy that her export business has picked up in recent years, and is convinced that her buyers are quite happy with SVLK. She says that without it her company would have closed down. Now she encourages others to follow her lead. She spent three years as the furniture producer association AMKRI’s* head of certification for Jepara, teaching its members about SVLK and guiding them step-by-step. “I helped 22 small and medium enterprises to get group certification,” she says. She also set up an association of businesswomen involved in different aspects of the timber product manufacture. Several members of this group — Jepara Women Entrepreneurs — are now SVLK-certified. Having done her part, Murliantini now urges her government, and those in EU member states, to do more to promote the SVLK and its FLEGT-licensed timber products so that buyers understand them like they understand FSC certification. Photographs from Sunteak Alliance, a furniture factory in Jepara, Indonesia, as well the area where the timber for the factory comes from.